An Inside Look at the 2016 Halloween Season at Haunted Woods Hayride! 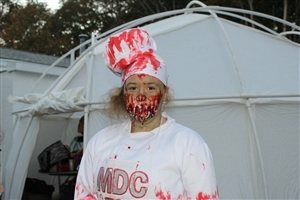 MAHauntedHouses.com recently sat down with Dennis Perron of Haunted Woods Hayride, to discuss what's new at Haunted Woods Hayride for the 2016 Halloween Season! Located in Grafton, Massachusetts, the Haunted Woods Hayride offers visitors a chance to wander through the woods of the Grafton Lions Club. The organization is made up of women and men who focus on the needs of the Grafton community. As thrill-seekers ride through the Haunted Woods, they'll experience a "Nightmare on Brigham Hill," where they'll meet with the lurking creatures. In 2015, Haunted Woods Hayride was rated the #1 Overall Attraction on MAHauntedHouses.com and the crew is eager to satisfy your appetite for fright once again during the 2016 Halloween Season! What's new at Haunted Woods Hayride for 2016? Do you have any new rides, attractions, or special features that Haunt Seekers should know about? We have a new theme for 2016, "Nightmare on Brigham Hill". The ride will feature random scenes from your nightmares. We will also feature a maze at the entrance to the ride. What are you most excited about for the 2016 Halloween Season? We are excited about our new maze! 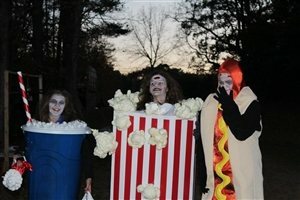 What differentiates Haunted Woods Hayride from other local haunts in Massachusetts? We have kept our price at $10 for adults and $5 for children under 5 years old. Parking is free! Our ride is entirely staffed by volunteers and all proceeds are given to Grafton Lions Charities. We provide entertainment while patrons are waiting in line, a local dance troop performs every half hour and there are plenty of parking lot zombies and spooks to keep patrons entertained. How long has Haunted Woods Hayride been in business? Can you tell us a bit more about Haunted Woods Hayride's history? This will be our fourth year. We started in 2013 as a way to utilize our 18 acres of fields and woods as a to way to raise funds for charity. What's your favorite experience since opening Haunted Woods Hayride? The number of volunteers that build the scenes and staff the ride is an amazing experience! How long is a typical haunt experience at Haunted Woods Hayride from start to finish? The experience starts at the ticket booth and continues throughout the ride. From start to finish including wait time is one hour. On a scale from 1 to 10, how scary would you say Haunted Woods Hayride is? Why? I would say the scare factor is an 8. It is scary but there are some light moments during the ride. Does Haunted Woods Hayride's property have any real haunted history? Do you have a spooky encounter you'd like to share? Since our first Hayride in 2013 some people who have been in the woods at night claim they see a ghostly figure floating in the trees. What inspired you to open up a haunted attraction? What's your favorite part of the business? We wanted to showcase our 18 acres of fields and woods to the public and to find a way to use the property to raise funds for local charities. How has new technology (i.e. animatronics, special props, etc) helped you to enhance Haunted Woods Hayride? While we have recently started using special props in some scenes, we mostly rely on "volunteers" to provide the scare factor. Can Haunted Woods Hayride accommodate large groups? How many people can experience Haunted Woods Hayride together as a group? We can put up to 25 people on a wagon and will accommodate groups who contact us ahead of time. Does Haunted Woods Hayride offer any special deals, discounts, or coupons? Because our price i so low, we do not offer any special discounts at this time. Anything else you'd like to let us know about Haunted Woods Hayride? This ride was rated the #1 Best Overall Attraction by MAHuntedHouses.com in 2015. Get the conversation started below!